Topping the golf ball out on the course, in front of your playing partners, can leave you feeling frustrated and even a little foolish. A topped approach shot into the green isn’t usually that destructive (the ball typically stays straight and can travel a fair distance), but it’s thoroughly dissatisfying and does little for your confidence. Topping the golf ball around the fringes of the green or in a bunker usually does spell disaster. 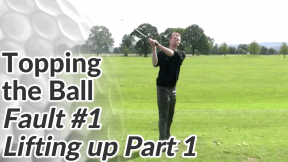 This How To Stop Topping The Ball mini series will help you eliminate topped shots from your golf game completely. I think it’s important to understand why you might hit more than your fair share of tops, so the first 2 parts of this series will look at common faults and causes. 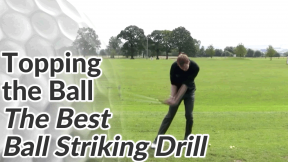 In part 3, we’ll cover what I have found to be the best drill for improving your ball striking. I’ve used this drill with many of my day-to-day students and it’s been so successful that it’s the only drill you’ll need to eliminate top shots and thin shots from your game. Side note For clarification purposes, we’ll assume that a top shot is when the golf ball is struck above it’s equator (near to the top of the ball), causing it to travel very low – usually along the ground. 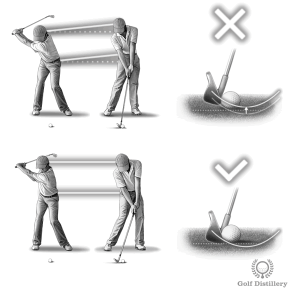 We’ll assume that a thin shot is just a less severe version of the top shot – so the club strikes towards the bottom of the ball but doesn’t get to the very botom of the ball. Even the best players catch the ball thin from time-to-time and the result is usually a shot that flies reasonably well but comes up short of the target. 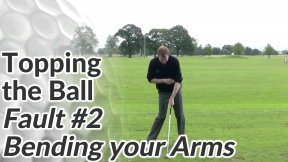 One of the main causes of topping the golf ball is standing up during the backswing and / or the downswing. Even a slight straightening at the hips can cause you to top the ball so it’s really important that you maintain your posture throughout the swing. A great indicator of whether this is happening during the backswing is to hold a club horizontally across your shoulders with the handle pointing towards the target. Make your backswing and see where the grip now points to. If you have maintained your correct posture, the handle should point directly to the ball as you complete your 90 degree shoulder rotation. 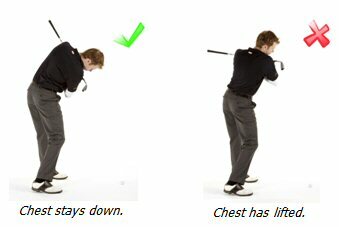 Lifting your chest during the downswing is one of the biggest causes of topping or thinning the golf ball. People often confuse this with lifting the head, but in reality lifting the chest should be of much greater concern to you. As you make a series of practice swings, feel how keeping your chest down and maintaining your posture from address will help you scuff the ground and start to take a divot. Apply this feeling when you swing at full speed and see how your strikes can improve.